2130 GMT: Jailing the Workers. Radio Farda reports the arrests of a number of labour activists in northwestern Iran in recent days. 2120 GMT: Mystery of Day. Iranian Labor News Agency reports that Ayatollahs Safi Golpaygani and Javadi-Amoli have met recently. Given that these meetings between senior clerics are rare, what were the issues that brought the two ayatollahs together? And was there any connection to the clerical disquiet over the Mohammad Amin Valian death sentence? 2045 GMT: Mohareb Trial for Dr Maleki? Iranian Labor News Agency reports that Dr Mohammad Maleki, the first post-1979 Chancellor of Tehran University is being charged with "mohareb" (war against God). Maleki's lawyer, Mohammad Sharifi said that his client, who is 76 and suffers from prostate cancer, is also charged with links to an outlawed organisation. 2040 GMT: Political Prisoner Watch. Banafsheh Darolshafaei, the sister of blogger Agh Bahman, has been released from detention. 1945 GMT: A Little Change? The Expediency Council voted overwhelmingly on Saturday to consider changes in Iran's electoral law, starting deliberations on qualification of voters, candidates, and the quality of election campaigns, according to Council member Mohammad Hashemi, the brother of Hashemi Rafsanjani. Hashemi said a large number of council members insisted on the need to reform the election law, prevailing over others who believed that the issue should be delayed due to the country’s "special condition". 1930 GMT: Nothing to See Here, Move Along. "Conservatives" in the Parliament have decided not to press the Ahmadinejad Government on the issue of last June's attack on Tehran University dormitories. The spokesman for the Majlis National Security and Foreign Policy Committee, MP Kazem Jalali, said the committee found nothing new in an 18-minute graphic film --- an abridged version of which was broadcast by Persian and found nothing new --- of the attack. 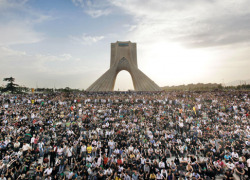 Jalali claimed that the emergence of the film, which was shot by a member of the attacking force, was because Iran's "enemies" were "disappointed" by massive pro-regime rallies on 11 February, Iran's nuclear, aerospace, and scientific achievements, and the capture of Jundullah leader Abdolmalek Rigi. 1620 GMT: The Rigi-US-Capitalism-Zionism-"9-11 Was a Lie" Conspiracy. Western news media have picked up on President Ahmadinejad's statement, in a meeting with Ministry of Intelligence personnel, that the destruction of the World Trade Center in New York on 11 September 2001 was a "complicated intelligence scenario and act": "The September 11 incident was a big fabrication as a pretext for the campaign against terrorism and a prelude for staging an invasion against Afghanistan." That, however, is only the top of Mahmoud's West-Did-It-All Iceberg. The full speech, reported by the Islamic Republic News Agency, announces that the arrest of Jundullah leader Abdolmalek Rigi exposes the core of the campaign by US and Israeli intelligence services against Iran. This in turn is part of a struggle of "good" human nature against the devils of capitalism, liberal democracy, and US global leadership. 1515 GMT: Women's Solidarity. Zahra Rahnavard, the wife of Mir Hossein Mousavi, has posted a message for International Women's Day on Monday. Rahnavard noted that discrimination and oppression of Iranian women has increased and invited the Iranian people and ruling powers to return to compassionate and humane values honouring the dignity of Iranian women. Rahnavard added that today the leading women of the Green Movement are unjustly in prison only because they demand justice in the political, social and cultural affairs of the country. She stressed that the Green Movement is the manifestation of the ideals of any noble and justice-seeking human and that it honours women because of these humane and moral principles. 1415 GMT: Mohareb Watch. We've published two updates on the case of Mohammad Amin Valian, reportedly sentenced to death this week. 1045 GMT: Political Prisoner Watch. Human Rights Watch has issued a statement calling on the Iranian judiciary to release six women, connected with Mothers of Mourning, arrested in January and early February 2010. Journalist Abolfazl Abedini Nasr was arrested at his home in the city of Ahvaz on 2 March by several men in plain clothes. The men, who all wore hoods, broke down the door of his house and brutally beat him. He had been earlier arrested on 30 June 2009 and freed on 26 October after putting up bail of 300 million tomans (270,000 euros). Several human rights activists were arrested on the same day, among them the blogger and activist Naghipour Nasour. The director of the website http://www.nasour.net/ was arrested at home in Qazvin by agents in plain-clothes. The reasons for his arrest and the place in which he is being detained are still unknown. Noushin Jafari, journalist for Etemad, arrested on 3 February. Reza Norbakhsh, editor of the daily Farhikhteghan, arrested at his workplace in Tehran on 4 August, and who had been sentenced to six years in prison for “taking part in illegal demonstrations” and for articles posted on the news website Jomhoryat. Mortaza Kazemian, journalist for several reformist newspapers, arrested on 28 December 2009, was released after spending 34 days in solitary confinement in section 209 of Evin prison. Journalist Said Laylaz had his sentence of nine years in jail reduced to three years by the Tehran appeal court. Kambiz Norrozi, head of the Association of Iranian Journalists, sentenced on 17 November to two years in jail and 76 strokes of the whip for making “publicity against the regime and disturbing public order”, had his sentence reduced on appeal to one year in prison. 0850 GMT: Political Prisoner Watch. HRA News Agency publishes reports, which we have heard for days, of "the widespread arrests of human rights activists, particularly members and affiliates of Human Rights Activists in Iran (HRA)". Among those detained in "at least 27 incidents of arrests" is Milad Abrahamian. 0845 GMT: Iran Down Under. Our partner, Arshama3's Blog, offers an interesting account of a meeting of activists in New Zealand supporting democratic change in Iran. 0835 GMT: We begin this morning with two specials, one putting a wry smile on a regime threat, the other offering a response to a story which has no smile. Our "black comedy" moment comes out of a speech by Iran's Minister of Science and Higher Education, Kamran Daneshjoo, in which he threatens to dismiss deviant professors. And our more serious reflections are in an open letter responding to the editors of Iran's "principlist" newspapers, who have criticised "Western" media for unfair coverage of Iranian events. Lack of confluence in Obama's Iraq and Iran policies. "One of the biggest failures of the administration so far is its seeming inability to coordinate its regional approach to the set of problems revolving around Iran, Iraq, and the Persian Gulf. At a conference on Monday at the American Enterprise Institute, Brian Katulis of the Center for American Progress called this "strategic incoherence." It's a critical failure because stability in Iraq, now at grave risk because of electoral shenanigans by Iran's allies in Iraqi politics, is very much dependent on Iran's role in Iraq." RE 1515 GMT: Women’s Solidarity.